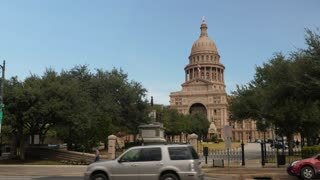 Search Results for "Austin Texas"
AUSTIN, TX - Circa December, 2017 - Traffic passes by the Texas state capitol in downtown Austin, Texas. 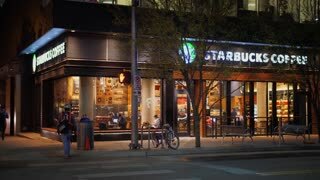 AUSTIN, TX - Circa December, 2017 - A nighttime establishing shot of a Starbucks Coffee Shop on Lavaca Street in downtown Austin, Texas. 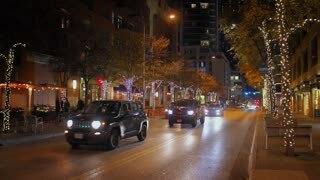 AUSTIN, TX - Circa September, 2016 - A driver's perspective on Congress Avenue in downtown Austin, Texas. 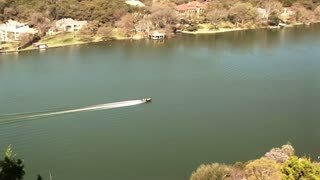 AUSTIN, TX - Circa December, 2017 - A rising aerial flyover of a train traveling on a bridge over the Colorado River in Austin, Texas revealing he Pfluger Pedestrian Bridge in the distance. AUSTIN, TX - Circa December, 2017 - A slow forward aerial view of a train traveling on a bridge over the Colorado River in Austin, Texas with the city skyline in the distance. 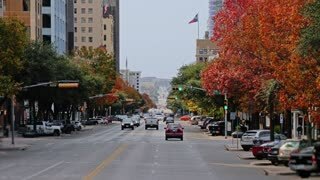 AUSTIN, TX - Circa December, 2017 - A long shot view of traffic and businesses along Congress Avenue in downtown Austin, Texas on an overcast day. 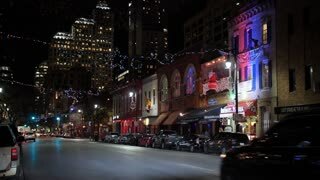 AUSTIN, TX - Circa December, 2017 - A nighttime establishing shot of bars and restaurants on E 6th Street in the historic tourist district of Austin, Texas. Day/night matching available. AUSTIN, TX - Circa December, 2017 - A daytime exterior (DX) establishing shot of a red brick bar and restaurant in downtown Austin, Texas. AUSTIN, TX - Circa December, 2017 - A street performer plays the drums for passing tourists on E 6th Street in downtown Austin, Texas at night. With audio. AUSTIN, TX - Circa December, 2017 - A lowering aerial view of a train traveling on a bridge over the Colorado River in Austin, Texas with the Pfluger Pedestrian Bridge in the distance. 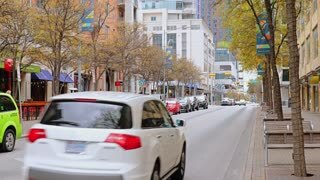 AUSTIN, TX - Circa September, 2016 - A driver's perspective on the streets around the Capitol Building in downtown Austin, Texas. 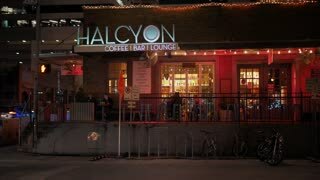 AUSTIN, TX - Circa December, 2017 - A nighttime establishing shot of a bar/restaurant on West 4th Street in downtown Austin, Texas. Day/night matching available. AUSTIN, TX - Circa December, 2017 - A daytime establishing shot of The Driskill Hotel in the historic district of Austin, Texas decorated for Christmas. Day/night matching available. AUSTIN, TX - Circa 2017 - A daytime establishing shot of a corner bar/restaurant on West 4th Street in downtown Austin, Texas. Day/night matching available. 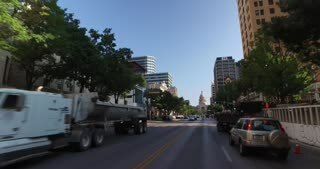 AUSTIN, TX - A driver's perspective on the South Congress Avenue Bridge in downtown Austin, Texas. 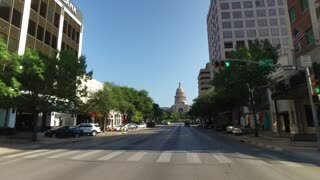 AUSTIN, TX - A driver's perspective on Congress Avenue in downtown Austin, Texas. 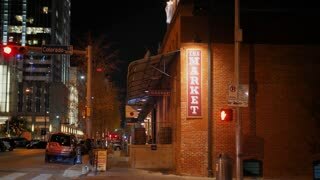 AUSTIN, TX - Circa December, 2017 - A nighttime establishing shot of bars and restaurants on West 4th Street in downtown Austin, Texas. Day/night matching available. 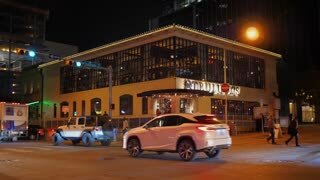 AUSTIN, TX - Circa December, 2017 - A night exterior establishing shot of traffic passing bars and restaurants on 2nd Street in downtown Austin, Texas. Day/night matching available. AUSTIN, TX - Circa December, 2017 - A nighttime establishing shot of The Driskill Hotel in the historic district of Austin, Texas decorated for Christmas. Day/night matching available. AUSTIN, TX - Circa December, 2017 - An aerial establishing shot of The Long Center for the Performing Arts in Austin, Texas. AUSTIN, TX - Circa December, 2017 - A nighttime establishing shot of a corner bar/restaurant on West 4th Street in downtown Austin, Texas. Day/night matching available. 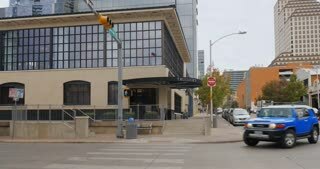 AUSTIN, TX - Circa December, 2017 - An overcast daytime exterior establishing shot of traffic passing bars and restaurants on 2nd Street in downtown Austin, Texas. Day/night matching available. 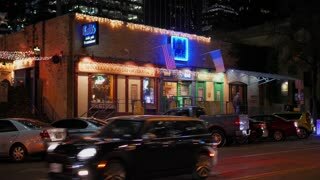 AUSTIN, TX - Circa December, 2017 - A daytime establishing shot of bars and restaurants on West 4th Street in downtown Austin, Texas. Day/night matching available. 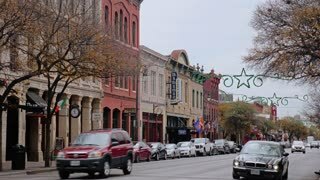 AUSTIN, TX - Circa December, 2017 - Traffic passes bars and restaurants on E 6th Street in Austin's historic tourist district on an overcast day. Day/night matching available. AUSTIN, TX - Circa December, 2017 - Traffic passes bars and restaurants decorated for Christmas on E 6th Street in Austin's historic tourist district. AUSTIN, TX - Circa April, 2016 - An establishing shot of the famous Austin Riverwalk. AUSTIN, TX - Circa December, 2017 - Traffic passes bars and restaurants decorated for Christmas on E 6th Street in Austin's historic tourist district on an overcast day. Day/night matching available. AUSTIN, TX - Circa December, 2017 - Traffic passes bars and restaurants decorated for Christmas on E 6th Street in Austin's historic tourist district on an overcast day. City skyline in background. 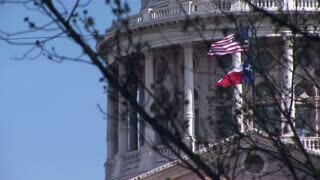 A nighttime (NX) front angle view of the Texas state capitol building in downtown Austin, Texas. Day/night matching available. 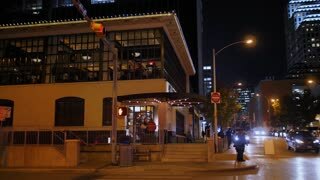 A nighttime time lapse view of traffic on the South 1st Street Bridge in downtown Austin, Texas. AUSTIN, TX - Circa September, 2016 - A day timelapse establishing shot of the University of Texas Longhorns stadium. A static shot of the E 6th Street sign in the historic tourist district of Austin, Texas. 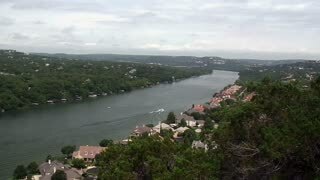 A daytime overcast aerial view of the Austin, Texas skyline from Zilker Metropolitan Park. A slow pushing forward aerial establishing shot view (DX) of the Austin, Texas skyline on a sunny late Autumn day. A slow aerial tilt down of traffic on the Congress Avenue Bridge over the Colorado River in Austin, Texas on an early Winter evening.